TDmonthly Magazine Products by UNCLE SKUNKLE TOYS, INC.
Products from UNCLE SKUNKLE TOYS, INC. In this medieval-themed game for two to four players, oppenents must work to protect their castles as they try to knock the other players' wrecking balls off track. It's a sturdy wooden game with several movable elements. Launch date: 2010. Rapid 4® is the quick connection game that reminds us of a pachinko machine that involves luck and strategy. Players take turns dropping marbles through the maze of levers in order to get a winning combination of 4 in a vertical, horizontal, or diagonal. The removal of a fifth marble in a column allows for continuous play and unexpected twists. Rapid 4® is a great game and gift - for home or vacation fun. Available in Wood ($44.99) or Plastic ($19.99). Available in wood only, Rapid 4 More® adds more excitement and strategy to the fast-paced game of Rapid 4, with the addition of an entirely new, large playing surface. Play both sides of the board in your pursuit to grasp victory while foiling your friends along the way. Rapid 4 More also allows up to 4 players, extending the level of zany enjoyment to all involved. — "This is a perfect game!" raved 7-year-old Ben Christensen, a reviewer in TDmonthly's Grade-School Roundtable, which collectively awarded Rapid 4 More four out of five TD stars. — "For about age 8 and up Rapid 4 More is a fast fun interactive game for 2 to 4 players. Get 4 balls in a row in any direction, but be careful because you have to drop your balls from a maze to do it. A fun strategy game. Recommended!" Jennifer Shuman, of 1SmartNoodle, told TDmonthly at Toy Fair 2010. The wooden version of the quick-connection game involves both luck and strategy. Players take turns dropping marbles through the maze of levers in order to get a winning combination of four marbles in a vertical, horizontal or diagonal. The removal of a fifth marble in a column allows for continuous play and unexpected twists. The beautiful, fold-up wood design makes Rapid 4® Wood attractive when left out in a den and a snap to pack up and take on vacation. This product is a Dr. Toy Best Product Award winner. Launch date: June 2008. The spinning wheel strategy game is as simple as checkers, yet as intriguing as chess. The game’s creative design allows players of all ages to spin the color wheel and try to get a winning combination of five across or down. Launch date: September 2008. The quick connection game involves both luck and strategy. Players take turns dropping marbles through the maze of levers in order to get a winning combination of four marbles in a vertical, horizontal or diagonal. The removal of a fifth marble in a column allows for continuous play and unexpected twists. Launch date: January 2008. 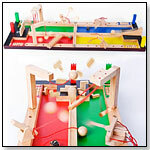 Players build the tower, roll the dice to determine the destructive device and then knock down the tower with the Catapult, the Pendulum or the Ramp. The entire set is made from beautiful, sustainable rubber-tree wood. 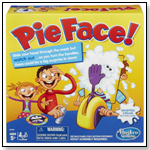 This game received a 2007-2008 Informal Education Products Award. Launch date: June 2008.